noun, plural quandaries : a state of perplexity or uncertainty, especially as to what to do; dilemma. There is no dilemma involving AT/B’s present in the coastwise or ocean transportation marketplace. AT/B’s are indeed increasingly supplanting ships in the Jones Act coastal trade. It is a trend that is slowly beginning to spread to coastwise transport in other regions of the world as well. But the reality is, that it is also a force in deep water/ocean transport as well. So I want to examine the assertions made by the article’s author and essentially show the inaccuracies present in them, and provide the actual facts that trump the opinions expressed by the author. My goal is to deal with the technical inaccuracies of the article. I will leave it to others to deal with the manning contentions – though I will cover them with regard to places where they are not correctly stated as they apply to AT/B’s themselves. The very first paragraph of the article is grossly inaccurate. There is no “safety gap” between AT/B’s and ships. 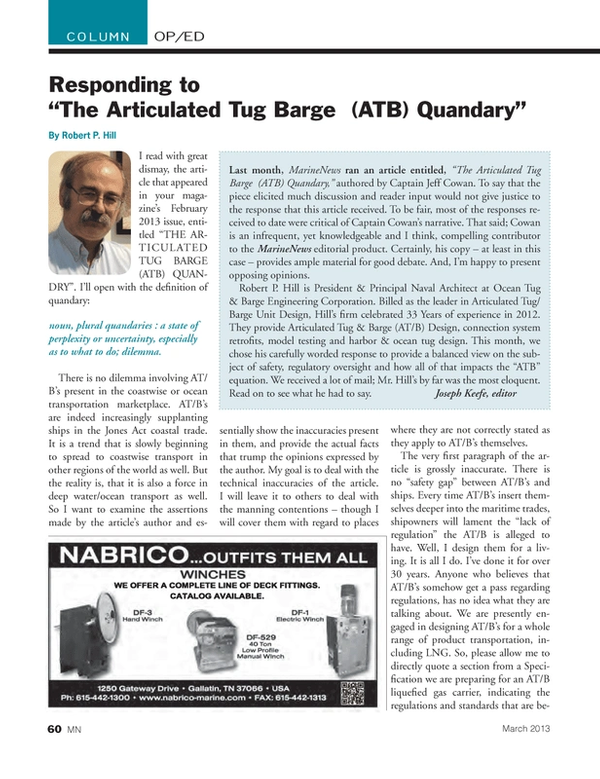 Every time AT/B’s insert themselves deeper into the maritime trades, shipowners will lament the “lack of regulation” the AT/B is alleged to have. Well, I design them for a living. It is all I do. I’ve done it for over 30 years. Anyone who believes that AT/B’s somehow get a pass regarding regulations, has no idea what they are talking about. We are presently engaged in designing AT/B’s for a whole range of product transportation, including LNG. So, please allow me to directly quote a section from a Specification we are preparing for an AT/B liquefied gas carrier, indicating the regulations and standards that are being applied to the design of this AT/B. Note that we apply a similar range of project-specific Regulatory scope in ALL the AT/B’s we design. USCG NAVIC 12-82 - Time Weighted Noise Exposure … Compliance w/IMO Noise Criteria. ILO, convention no. 92 and no.133 for crew accommodation. The above list of regulations that our units meet, is not a “wish list.” It is the reality of what we do. To be certain, there are some regulations that do not apply to Unmanned Barges. Why? Because they are as noted; “unmanned.” As a designer however, I have yet to have a client who did not ask me point blank if something that is not required by regulation, is truly needed for safety – and not a one who refused to install something I felt was necessary for the safety of the crew. It is news to me, and to my clients that charterers allow extra days when chartering an AT/B due to weather being a concern. An AT/B can operate in the very same weather as a ship can, and truth be known, ships sometimes slow more than AT/B’s in bad weather due to propeller and rudder emersion. I do not know of a single AT/B utilizing a high capacity connection system that came out of the notch because a pin broke – the connections are designed along with their surrounding structure, for as much as 3X the expected loads. Name me all of the AT/B accidents using a major connection system since they came into widespread use in the 90’s where there was a casualty? An oil spill? The author’s description of the motions of an AT/B is also incorrect. The contention regarding emergency hawsers parting due to no catenary is also incorrect. The AT/B’s I design have at least 1000’ of emergency hawser aboard. It is pure scare-tactics to contend that if an AT/B barge got away we’d have a repeat of the North Cape disaster. Rubbish. The North Cape was a single hull barge – all AT/B petroleum and chemical barges are double hull and the North Cape got away from a towing tug, in horrible weather they should not have been out in – not an AT/B. Whatever would befall an AT/B barge aground would also happen to a ship aground. And look at the largest spills since the 90’s. How many were from AT/B’s – how many from tankers? MANY more tanker accidents with significant spills. It is more likely that a ship will lose steering (see recent experience) or propulsion (see recent problems with fuel switchover in ships) than a tug losing a properly sized towing hawser while holding station offshore. So by the author’s reasoning, we should see tankers as the real “quandary”. He cites ship accidents as the reason why one has to further regulate or by implication, bad – the demonstrably safer AT/B. AT/B motions? “Poor Souls” and pendulum movement? Has the author ever even ridden an AT/B? I have. There are YouTube videos that can be watched. The motion is not horrible even in extreme seas – and we design these boats for a significant height sea spectrum exceeding 7M. Talk to an AT/B operator instead of relying on hearsay. AT/B’s ROUTINELY operate in trans-oceanic service. I know because my boats do it. The limitations of space for this article do not allow me to enumerate the many cases of such, but they operate under the same international rules as ships do. Space limitations again prohibit me from answering each inaccuracy in the article, but interested parties are welcome to contact me at rhill@oceantugbarge.com to hear the REAL AT/B story. I would not send a person to sea on an unsafe vessel design. The safety of these crews is everything to a naval architect. We have to think of them constantly. To suggest by inference that those of us who design or operate these vessels care nothing for the concepts of safety or environmental protection is to do an injustice to a lot of good people. The TRUE AT/B record speaks well for itself.